Hellboy made a comeback through Neil Marshall's ultra-violent reboot, but his return unfortunately wasn't well-received. Starring David Harbour as the big red anti-hero himself, the new Hellboy flick crashed and burned commercially and got a lethal flaming from fans and critics. It's quickly made its way onto worst-of-the-year-lists, has been slammed as a "painfully predictable box office disaster," and runs the risk of costing studio Lionsgate a pretty penny with its disappointing dividends. An air of despondency hangs around the Hellboy reboot, but one person who isn't taking the criticism lying down is the film's big bad. 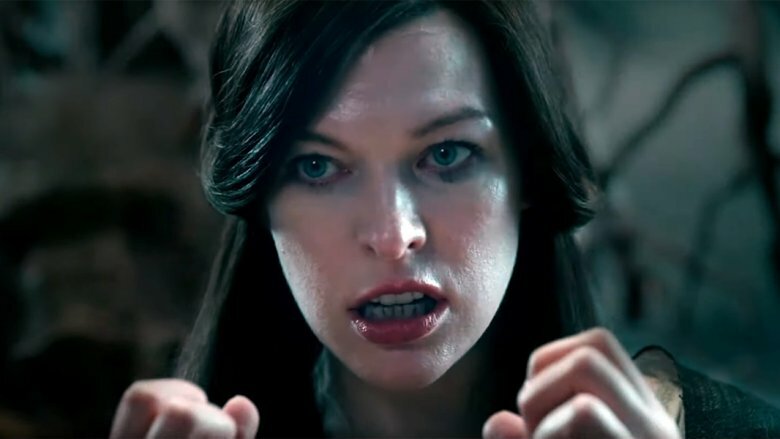 Actress Milla Jovovich, who brings to life the nefarious Nimue the Blood Queen in the reimagining, took to Instagram to address the Hellboy backlash. The biggest takeaway from her response? She's not fussed by the naysayers, as she stated all her "raddest" movies have been critical failures. "It's always stressful on opening weekend and @hellboymovie is no different. You work super hard to make something fun and entertaining and have to absorb the negative reviews by movie critics, but hey! THAT'S SHOWBIZ BABY," wrote Jovovich. "All I'm gonna say before going to bed is this: All my raddest films have been slammed by critics. It's f****** hilarious. Dazed and Confused? Seriously? Classic movie. The Fifth Element! You would have thought that was the worst movie ever made if you read the reviews in like '98." Jovovich pointed to a few more of her past critically-hated films that she had a ton of fun making as proof of her theory that the Hellboy reboot will become a cult classic soon enough: "Zoolander? Slammed. Joan of Arc? Disaster. Resident Evil? Let's not even go there. Anyway, every one of those films is now a cult classic. EVERY. SINGLE. ONE. And this will be too. Mark my words." She continued, running through three reasons why future generations will appreciate Hellboy as a film that critics and audiences didn't "get" at the time. "Why? 1. Because of the amazing actors. David Harbour. Ian Mcshane. Daniel Dae Kim. Sasha Lane. They are all so damn wonderful and talented, the movie is worth seeing just because they're in it, especially one that's so much fun to experience as this is," Jovovich wrote. "2. @mikemignola who created the #Hellboy comics helped write the script and was on set every single day to make this film as close to his vision as possible. 3. It was directed by one of the greats. #NeilMarshall who brought us The Descent. One of the greatest horror movies ever. Trust me, you're gonna have a blast watching the new @hellboymovie. I mean, one critic said 'it's a loud, gory mess only a teenager would love.' HELL yea Hellboy! Let's have some fun! And with that, I wish you all a good night! Xo m."
To her credit, Jovovich isn't wrong: Dazed and Confused bombed at the box office when it opened in 1993, and now it's one of the most beloved movies from that era — so much so that it's difficult to believe the film didn't turn a huge profit. Critics really didn't dig Zoolander when it premiered in 2001 or The Fifth Element when it opened in 1997, but people went on to love both — kookiness and all. While the Resident Evil franchise hasn't ever been universally loved, it still holds a special place in the hearts of many. The same can be said for The Messenger: The Story of Joan of Arc, which is a total stinker by Rotten Tomatoes standards but a "unique, underrated, misunderstood" film in some fans' eyes. It's true that some box office bombs are worth watching, but it's also true that some cult classics are actually awful films. Correlation doesn't equal causation — and even if the Hellboy reboot can rise from the ashes and find a new audience like Jovovich predicts it will, the vast majority of people may still think it's terrible.